The nature of our work brings many hazards. Therefore, it is fundamental that we are aware of the health, safety and environmental impacts involved in building and maintenance work, from office refits and property refurbishments to our reactive maintenance services in Exeter. At Cowley’s, we recognise the importance of this, which is why we fully comply with the Health & Safety Work Act 1974 and CDM Regulations (amended April 2015). We are proud to uphold several accreditations and belong to a range of trade associations. By obtaining these accreditations, our customers – existing and potential – can ensure they are in safe, confident hands. We want to make sure all of our professional builders in Exeter are working in the safest of conditions. Our Devon Commercial Building Contractors work hard to obtain the highest of safety regulations. As a well-reputed building and maintenance company, our team of tradesmen ensure full compliance with these workplace regulations and take them very seriously. A viable, credible leader in Health & Safety Management. To gain accreditation to CHAS they rigorously vetted our Health & Safety standards and procedures, working environments and staff communication. The CIBT levy allows us to apply for grants towards ongoing training for our staff, enabling them to gain new qualifications. It also allows small businesses to employ apprentices. It is important to Cowley’s that young people are given the opportunity to enter this profession where there has been an identified shortage. Cowley’s has been fully trained in the repair care system – a range of products that can achieve durable, permanent repairs at a fraction of the cost of replacement. Specially developed for the long-term maintenance of public, commercial, listed and domestic properties, the Repair Care system provides a sustainable alternative to replacement. This scheme gives our customers confidence by ensuring we have been rigorously tested by trading standards and that we comply with their standards. The recognised Exeter City Council Environmental Management accreditation. 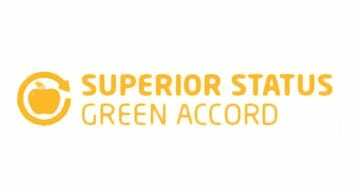 We hold superior status, which emphasises our commitment to reducing our environmental impact and the way our company disposes of waste and recycling, using sustainable products where we can. We have just been awarded Gold status with ACDC, by gaining this accreditation it ensures that we as a Company are committed to best practice and are assessed to the very highest standard of quality within our industry. We value our staff and provide ongoing training throughout their employment to ensure there are fully compliant with legislation and safety onsite. We use SSG and Onelife Training in Exeter for our external training needs, but also have in-house training courses. All our team are asbestos trained and attend a refresher course each year, first aid at work, working at heights and manual handling to name but a few. Cowley’s is an Equal Opportunity Employer.